Diesel was adopted by Dean in mid-2015. He is blind in one eye but that does not stop him! Dean says “Diesel is an awesome companion. He loves traveling and seeing new places and has been truly a real joy to join me on the road. 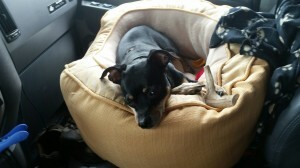 And, of course, is spoiled rotten.” Diesel is a great trucking dog!!! Way to go Diesel!